Walking through Palermo Hollywood for the first time in September, I saw several chic restaurants . Then I got to the corner of El Salvador and Fitz Roy, where a crowd hummed outside a bustling restaurant, and something immediately appeared different. Las Cabras had me at hello. This parrilla offers big plates, wonderful ambiance and a price tag that will satisfy any patron. 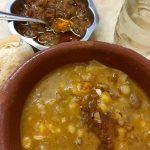 Simplicity distinguishes Las Cabras from other restaurants in the area. Red, wooden tables dot a pebble-covered, shady patio on the Fitz Roy corner. White, crayon-ready paper serves as your tablecloth. The warm lighting from inside helps illuminate the patio, which encompasses both sides of the corner. 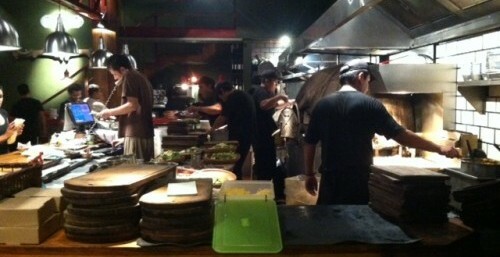 The place beams with energy and smiles from one table to the next. Las Cabras is great for a couple’s dinner or a reunion with friends. I often see people on dates inside and groups of ten or more outside. 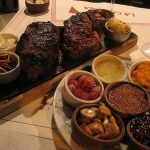 It’s the kind of place where dinner can last for hours and you can sit, enjoy your company and indulge in Argentina’s prized commodities for as long as you like. You’re bound to see other travelers or expats at Las Cabras, but porteños dine here nightly as well. My go-to for steak is entraña (skirt steak), which comes with two healthy strips of meat and a Caesar salad. Asado de tira (braised short-cut ribs) is another popular choice among my expat friends. 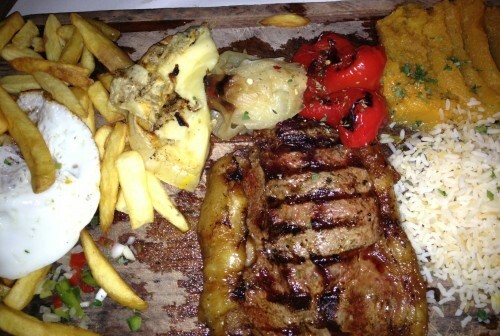 Typical Argentine cuts – ojo de bife (rib-eye steak), bife de chorizo (sirloin) – are on the menu as well. However, despite being very much a parrilla, the diverse menu at Cabras also reaches out to vegetarians. The pastel de calabaza y miel (Squash and honey and pie) may be the most delicious, filling and affordable dish in Buenos Aires. It comes in a heavy clay bowl, topped with a layer of melted cheese. The pastel is mashed squash filled with veggies, a really tasty creation that will end any of your hunger pains. The honey adds a light, sweet finish to the taste buds. The salads and antipasto plates at Cabras are also big hits given their ample size and tasty ingredients. But if you’re a carnivore and you only have one night for Las Cabras, you must challenge yourself to the Gran Bife de Las Cabras. This huge plate includes a sirloin steak, cooked to your preference, and a plethora of sides: fried veggies, a slab of grilled provolone cheese, French fries with a fried egg on top, rice and mashed squash. You may not need to eat breakfast the next day. The only precaution with Las Cabras is the wait. If you arrive after 9pm, especially on the weekend, expect to wait at least 30 minutes. An 8pm or 8:30pm arrival time should help you avoid rush hour. 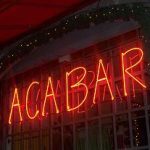 Despite any delay to your meal, the fun atmosphere, quality of food and affordability will keep you coming back to Las Cabras for more. Getting there: Unless you know the bus system or take a taxi, bring your walking shoes. The nearest subte stop on the D line is the Palermo station. From there walk two blocks up Santa Fe, go left on Fitz Roy and walk seven blocks to the corner of Fitz Roy and El Salvador. On the B line, get off at Dorrego, walk twelve blocks along Bonpland, turn right on El Salvador and go one block to Fitz Roy. The 108 bus line stops within a block of Las Cabras, and it also goes through Recoleta on Av. Santa Fe, plus through Palermo at Plaza Italia. Morelia, Palermo Hollywood Both a stylish Palermo Hollywood lounge and a true Buenos aires pizza kitchen, Morelia Pizza Restaurant offers a chic atmosphere to compliment its signature thin crust "pizza a la parilla". El Tejano – BBQ in Buenos Aires El Tejano serves the best American BBQ in Buenos Aires. Smoky briskets, juicy pork ribs and a creative spin on Argentine meat make this homemade, closed-door dinner an unforgettable event.